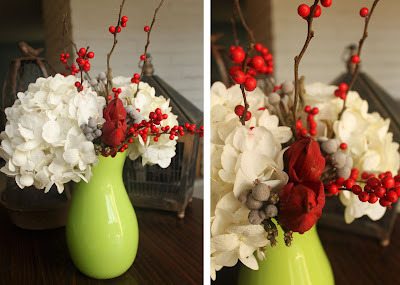 I spent some time today arranging some Christmas floral bouquets to give away as Christmas gifts. I wanted these gifts to have a personal touch, so instead of ordering bouquets, I picked out my own flowers and vases and arranged them myself. I was a little surprised, but there were really only 2 red flowers to choose from; roses and amaryllis. 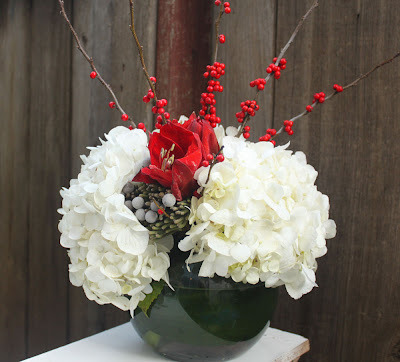 I thought roses were a little too Valentine's Day and I really liked the way the amaryllis looked with the hydrangeas and holly berries. 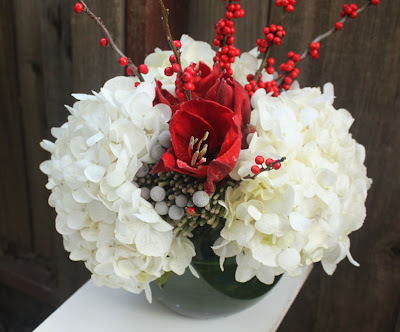 Here are the 2 different holiday arrangements that I made. 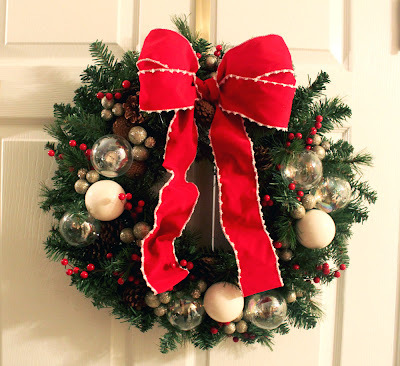 This past week I also helped my sister make a wreath for her door to coordinate with the rest of her cherry red and white Christmas decorations. Here is our finished product, so much more fun and personal than buying a pre decorated wreath! While I was at the wholesale flower warehouse today I saw so many different types of real holiday greenery for mantle and doorway garland and real leaves and needles made into square or round wreaths. There is such a huge difference between real greenery vs. faux, which I didn't really realize until I had a closer look at it today. It's a little late to start now, but next year I'm definitely going to see what I can create using real foliage. Holy Cow! I should have held out for a flower arrangement. They're both amazing. But I like the darker green vase better. Your clients are some lucky people this Christmas season!